It’s been a doozy of a year with some great highs (Go Cubs!) and some lows (ya know… let’s not dwell). I took trips to Alberta, Ireland, Baie Sainte-Marie (Clare) and Cape Breton, started a new relationship (hi LuShark!) 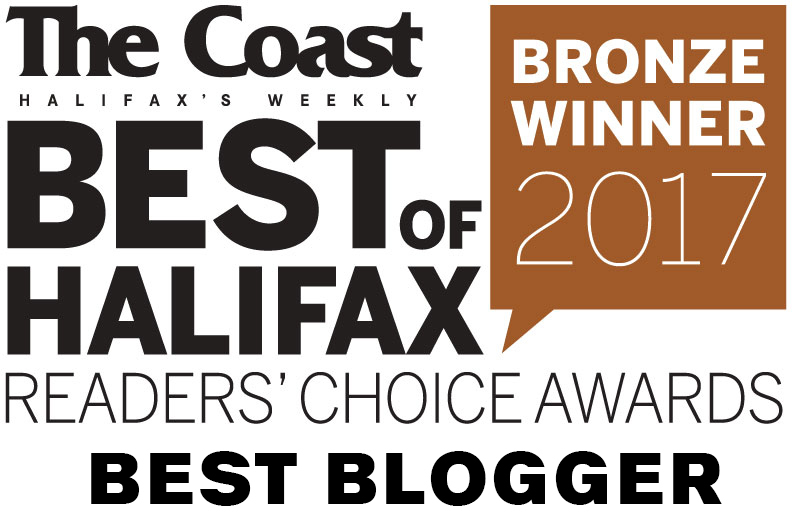 and won the title of Best Food Blogger in The Coast’s Best of Halifax, alongside good company: Life of Burgers and Kelly Neil. This is my end of the year round-up where I focus primarily on the meals that don’t fall into the spectrum of my blog content. I don’t generally write restaurant reviews, focusing instead on my food quests. But I like to wrap up the year with a list of my favourite meals. So here we go! Lincoln Street Food is a new-ish restaurant in the trendy dining scene of old historic Lunenburg. I didn’t know what to expect from this restaurant but was more than impressed. 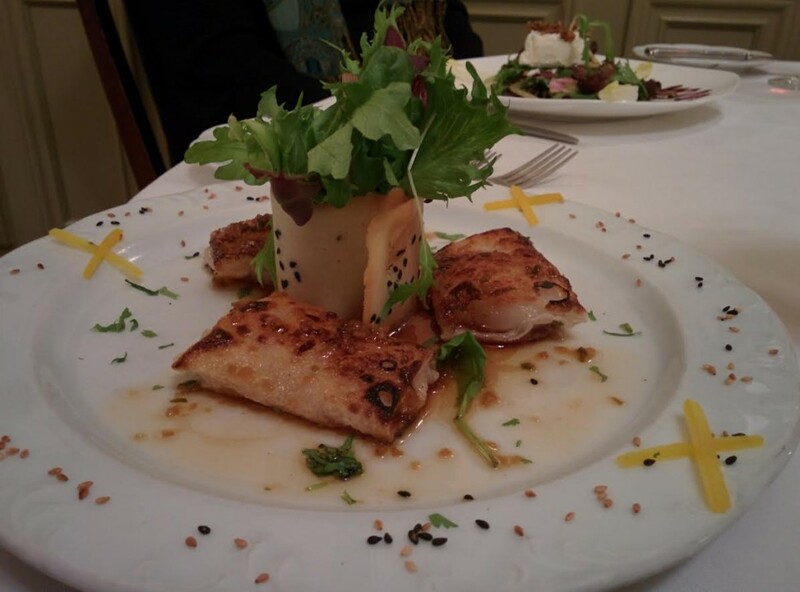 The ingredients were local, fresh and interesting; the execution was generous and creative. Just look at that plate! 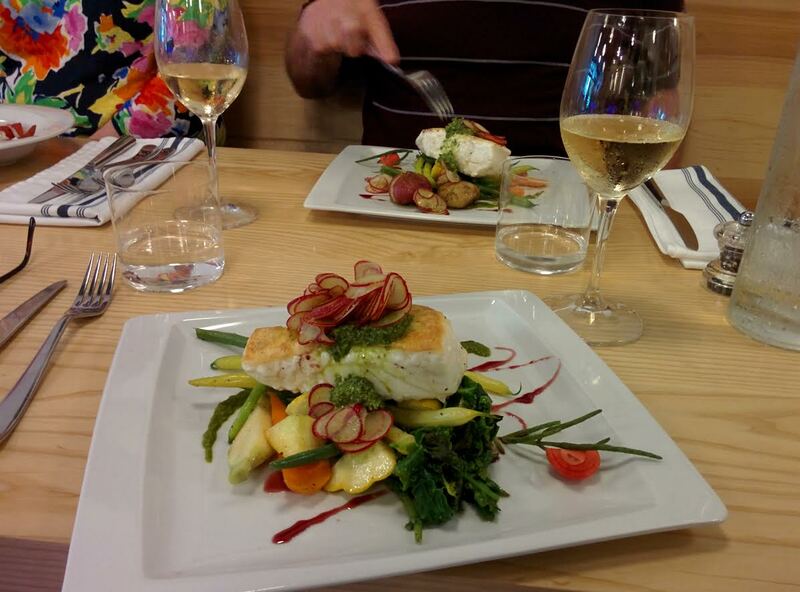 A nice piece of halibut on a pile of seasonal vegetables. Bam! My mouth and eyes are thankful. 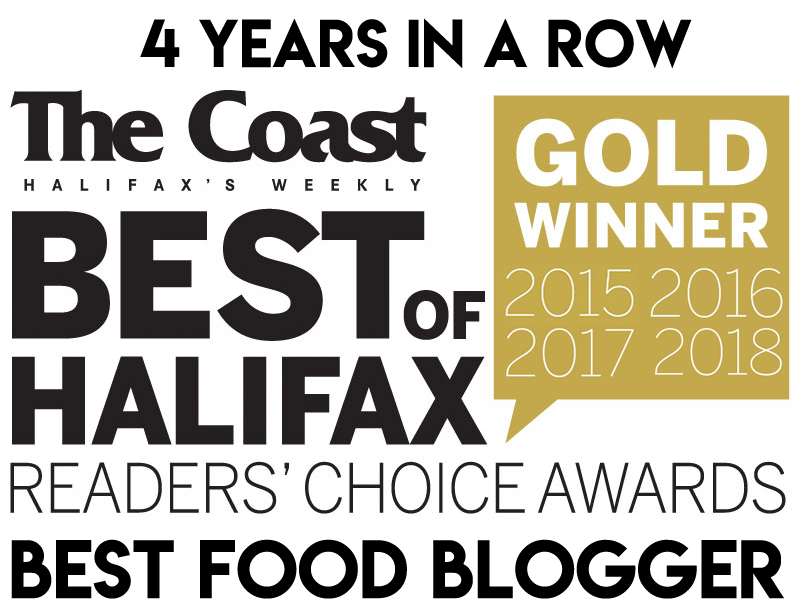 Stories is easily one of the best and most under-rated restaurants in Halifax. Fine dining prices can certainly be a deterrent to some, but I was fortunate to be treated to a birthday dinner here, and like my birthday here in 2013 it did not disappoint. Stories specializes in seafood and game. I took advantage of this and ordered the trio of game ($35 ≈): bacon-wrapped venison, pheasant confit and wild boar polenta pie. 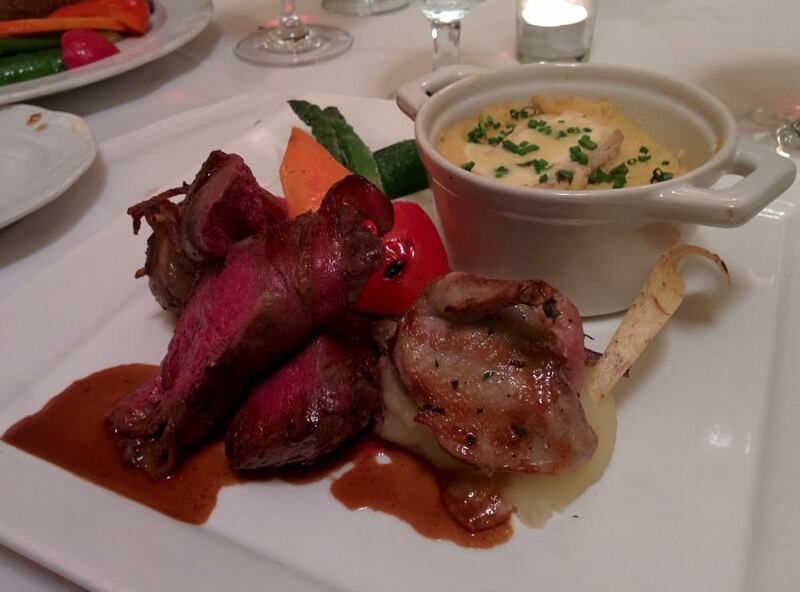 The highlight of my meal was definitely the venison – my mouth is watering just looking at it. 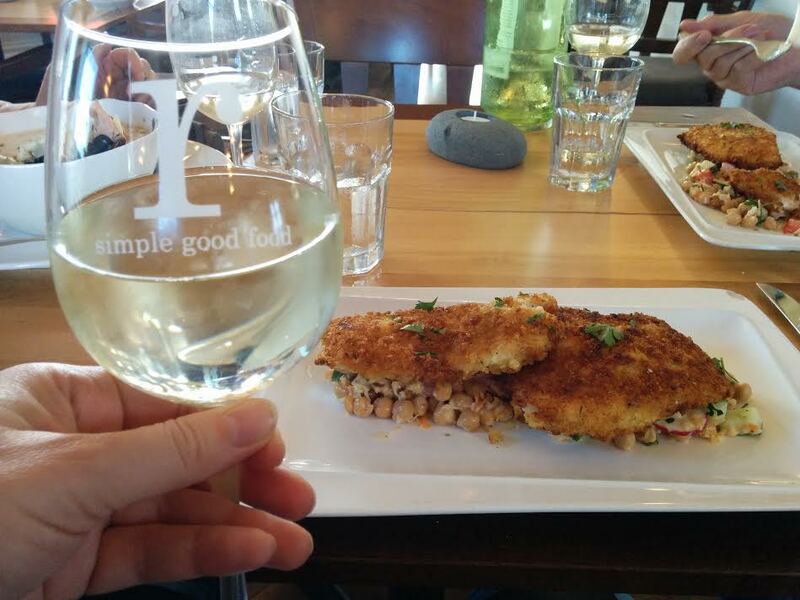 Rhubarb is located on the Peggy’s Cove loop and I fell in love with their Crispy Haddock ($24). There was a curry-like spice to the breading and the fish was served on a salad of cucumber, tomato, cabbage, onion and chickpeas with a honey mustard dressing. I really enjoyed this dish. I spent a weekend in Edmonton this year, and I wanted to have one nice meal to counter all of the donairs and perogies I had been eating. My research led me to Rge Road (pronounced “Range Road” – it’s an Alberta thing) for a taste of prairie cuisine. 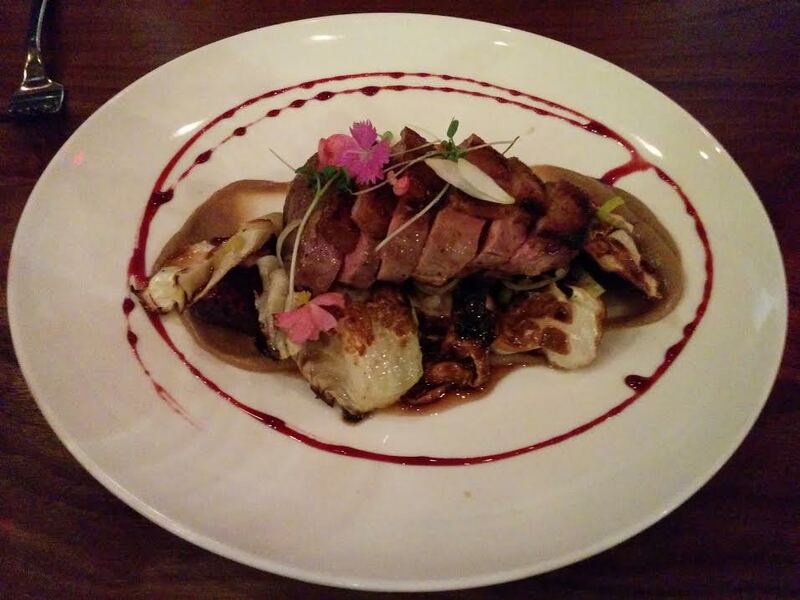 The dish pictured is LuShark’s duck breast with potato gnocchi ($34). I had the Pilatus Farms Bison ($34) with hazelnut spätzle. Both dishes were creative, well executed and pretty damn good lookin’. My Dad, Bro and I took advantage of a 5 hour layover in St John’s on our way to Ireland. You’d be crazy not to! St. John’s has some of the best dining in Canada and is a short cab ride from the airport. We ended up at the Gypsy Tea Room where I indulged in the NL Dressing Crusted Cod ($30). I love “Nouvelle Newfoundland Cuisine” in which traditional ingredients are reimagined into creative upscale dishes. 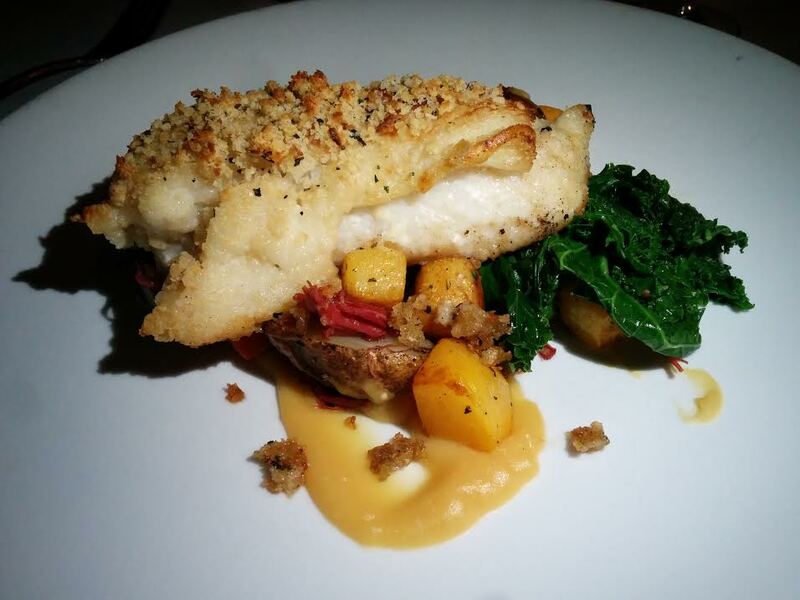 My cod was served with pease pudding puree, root vegetable hash, market vegetables, crispy salt beef, and mustard pickle vinaigrette. How Newfoundland is that?! 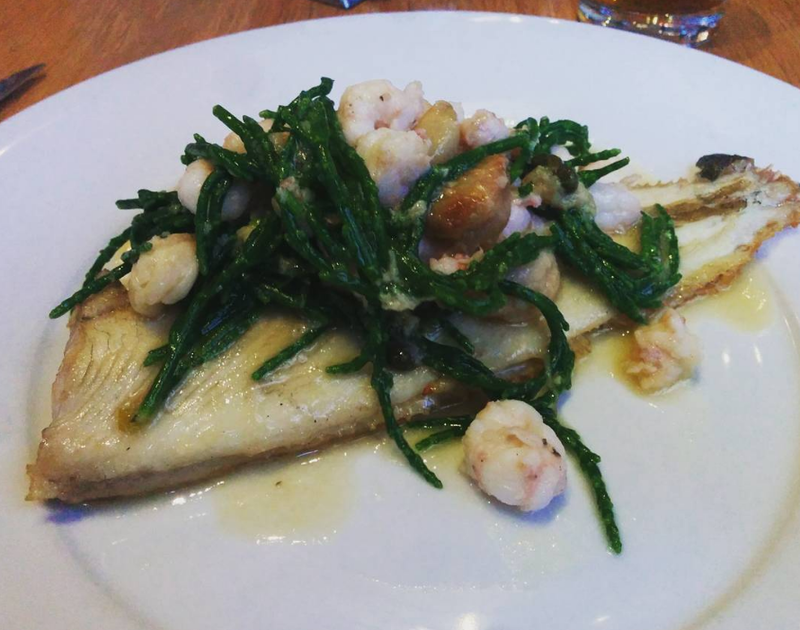 My research led me through Belfasts’ dining scene to James Street South, where I enjoyed some plaice with shrimps and samphire (sea asparagus) after a feed of Dundrum crab. My Dad would say our best meal in Ireland was at The Winding Stair in Dublin. Suffice to say, we did some good eating. 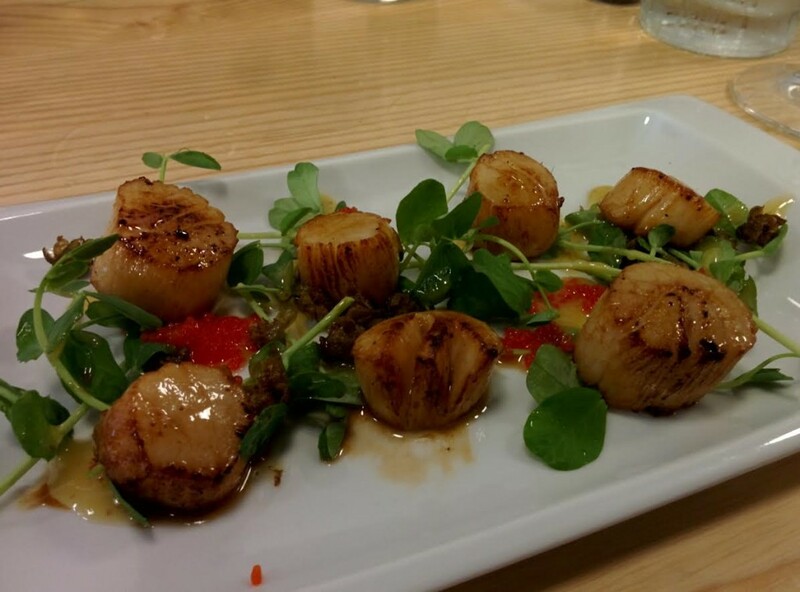 Pan seared chili dusted scallops, grilled lemon vinaigrette, kelp caviar, pea shoot salad ($14). Yup. My #1 pick for my best Maritime meal also served my favourite appetizer. Wonderful restaurant. I think this is the only permanent fixture on Stories’ menu ($17). It’s kind of their signature appetizer and for good reason. Tender scallops, crispy rice paper and a ginger sesame vinaigrette. Yum. The Kale Caesar is always a good choice at 2 Doors Down but this year I also discovered the Smoked Potato Chowder ($14) which is actually a seafood chowder of scallops, mussels, cold water shrimp, white fish and bacon. It’s now among my favourite chowders! 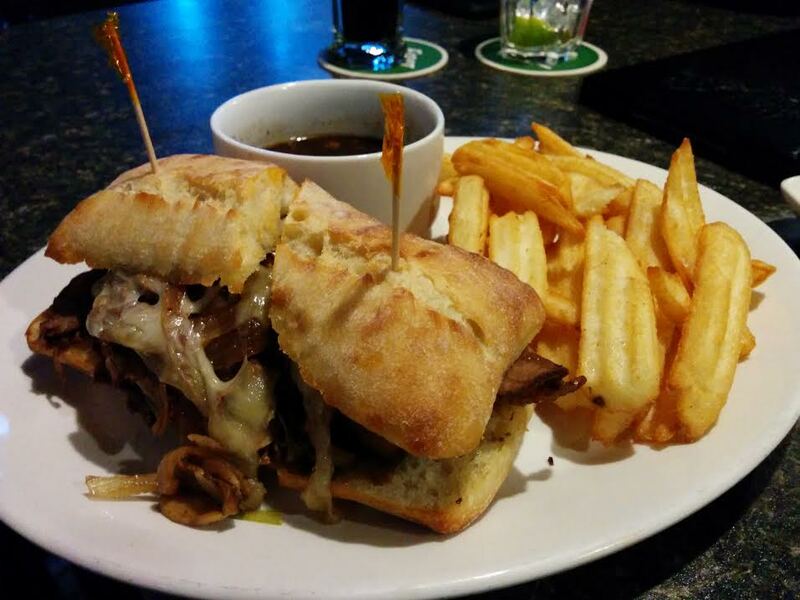 This was my first time eating at The Port Pub and O.M.G. I heard they had a good lobster poutine but I had no idea! 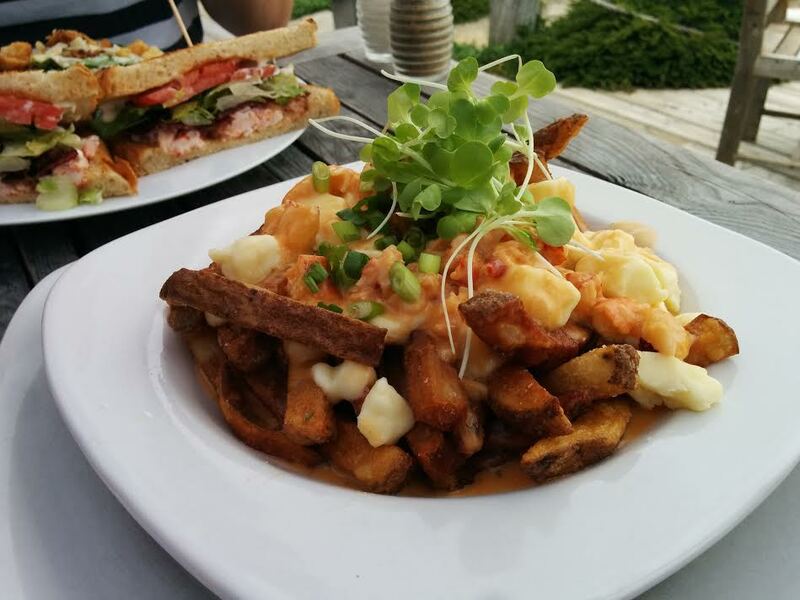 The Lobster Poutine ($14.99) had hand-cut fries, 2 oz of lobster, cheese curds and a lobster wine sauce. This is a good price for the quality and amount of food that you get. LuShark similarly had a fantastic experience with her Lobster Club (2 oz $16.99/4 oz $24.99). Our mouths were singing and we can’t wait to go back! 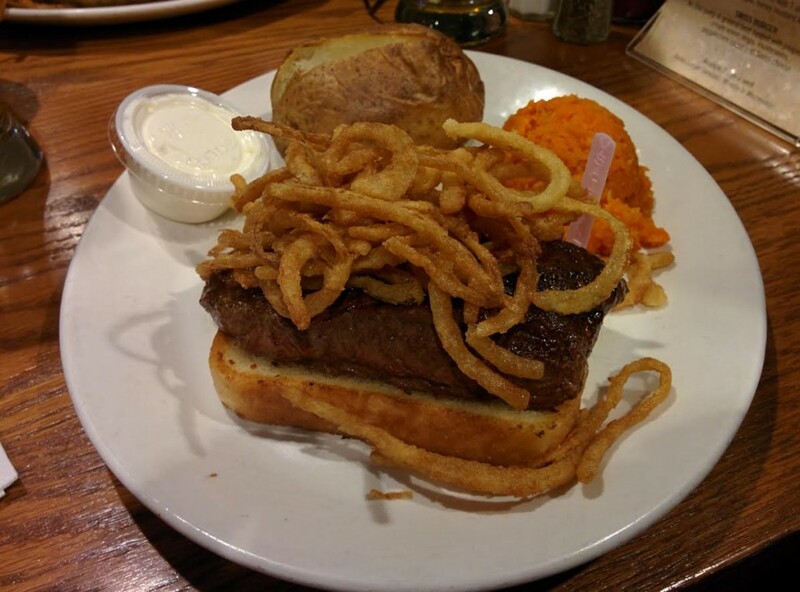 This Steak Sandwich ($14) at The Mic Mac Bar & Grill is not a regular menu item but if you find it on special don’t blink, don’t hesitate – DO IT! It’s a crazy good deal which includes your choice of potato and veg. We got baked potatoes and mashed veg, plus a generous amount of frizzled onions! Our steaks were just beautiful. This isn’t gastropub food but it’s damn good food. LuShark and I had a wonderful time at The Red Shoe Pub, where some planning is necessary if you intend on eating AND enjoying the live music. Tables become scarce in the evening so you should arrive early, but not so early that you have hours with nothing to do but throw ’em back before the show. Next thing you know, you’ll be doing your own version of Cape Breton step dancing while your designated driver looks on in embarrassment. Don’t let this happen to you! We planned accordingly and the locals seemed to dig LuShark’s step dancing. 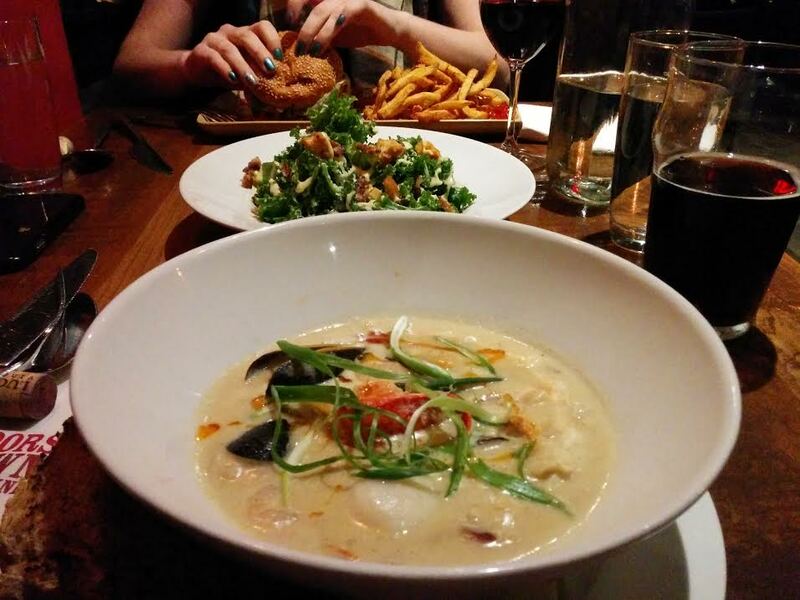 As for the food, we adored the Mabou Seafood Chowder (bowl $14/cup $10) with its drizzle of chili oil. 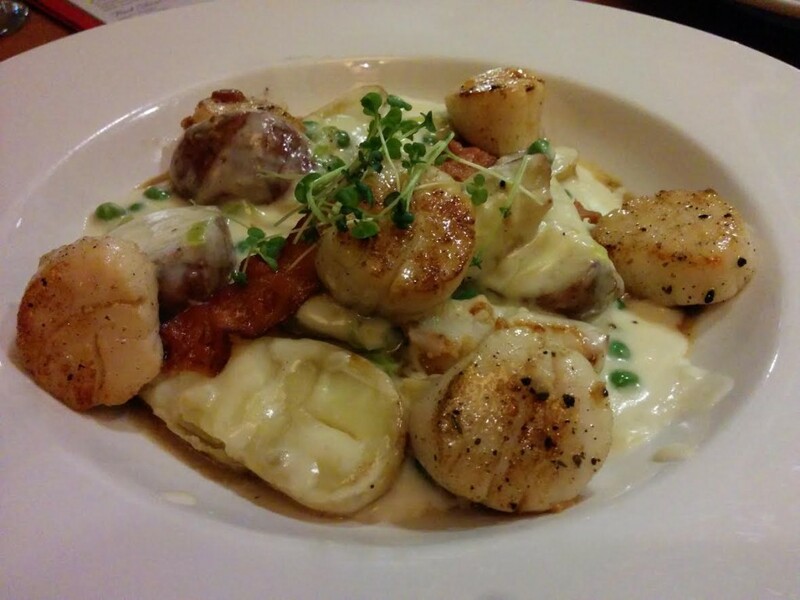 Pictured is my Pan Seared Scallops and Bacon ($23) with sauteed potatoes, leeks and peas in a “creamy fondue”, drizzled with a warm bacon vinaigrette. It is a misconception that corned beef and cabbage is an Irish dish (it’s American!). 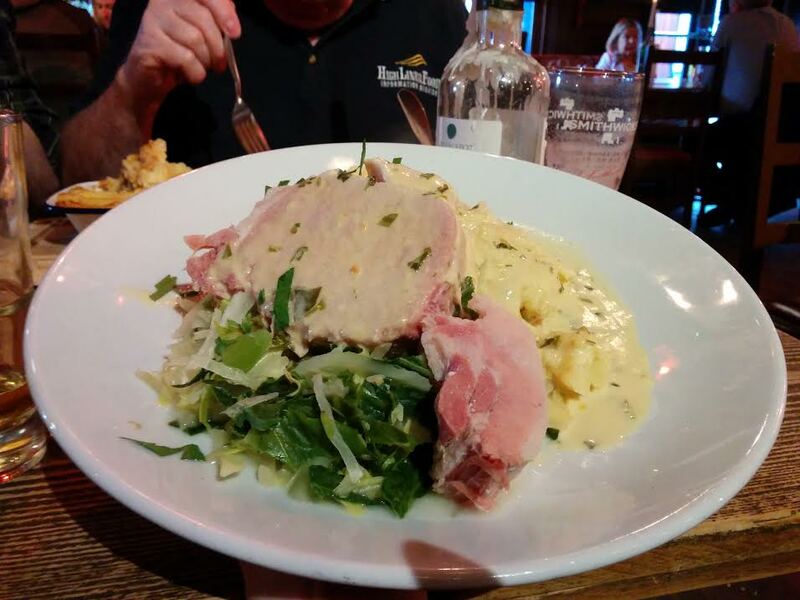 The dish of choice in Ireland is actually bacon and cabbage, where “bacon” is thick pieces of cured pork similar to ham and is served with mashed potatoes and a parsley sauce. The Oliver Plunkett is a live traditional music pub in Cork, and while I didn’t go upstairs for the music I did enjoy the Bacon and Cabbage (€ 13.90) which would end up being my favourite meal of the trip. I enjoyed Cork more than Dublin. It’s the kind of city I’d live in rather than visit. 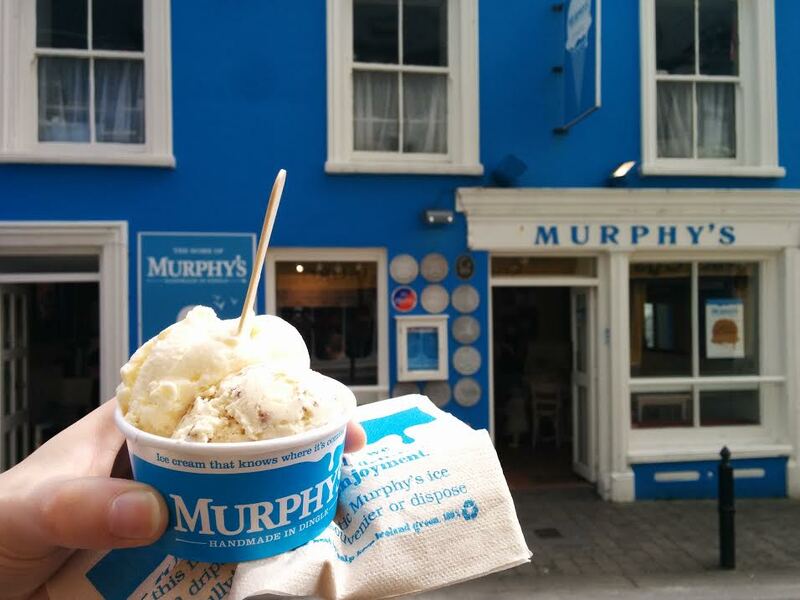 Fantastic food, pubs, breweries, friendly locals – don’t neglect it on your Irish travel itinerary. This gastropub is up and away from touristy Temple Bar and surrounding areas of Dublin. As far as I could tell, we were the only tourists in the place. There was a large selection of local craft beer and there was vegetarian haggis. After an artisanal black pudding and a lovely Ploughman’s platter, we enjoyed the Pan fried Haddock (€17.50) with “Jenga fries” and mushy peas. 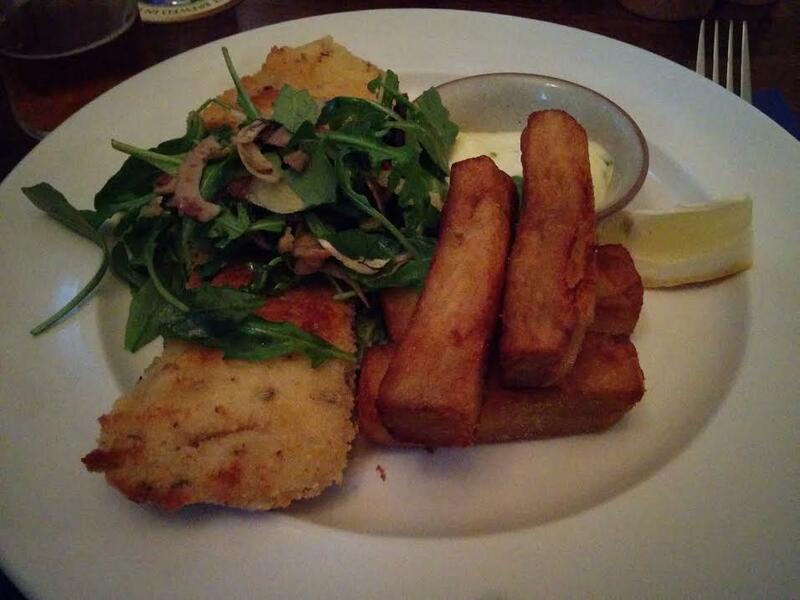 This was our first dinner in Ireland and an excellent choice. The furthest thing from an Irish Pub could possibly be an Alberta-style pub, characterized by its big open room, televisions, imported beers and scantily clad servers. They are often British or Irish in name but not in style; whether dark and divey or flashy and commercial, they are a whole other creature that often lives in the suburbs. The Pig and Whistle, when I visited, was worn and unpretentious. As I write this it is under new management and is now called The Tipsy Pig, so I don’t know if the food quality/atmosphere has changed. But as far as Albertan pub food goes, this is some of the best I’ve had. The beef dip was fantastic and the potato skins were the best I’ve had of that style. 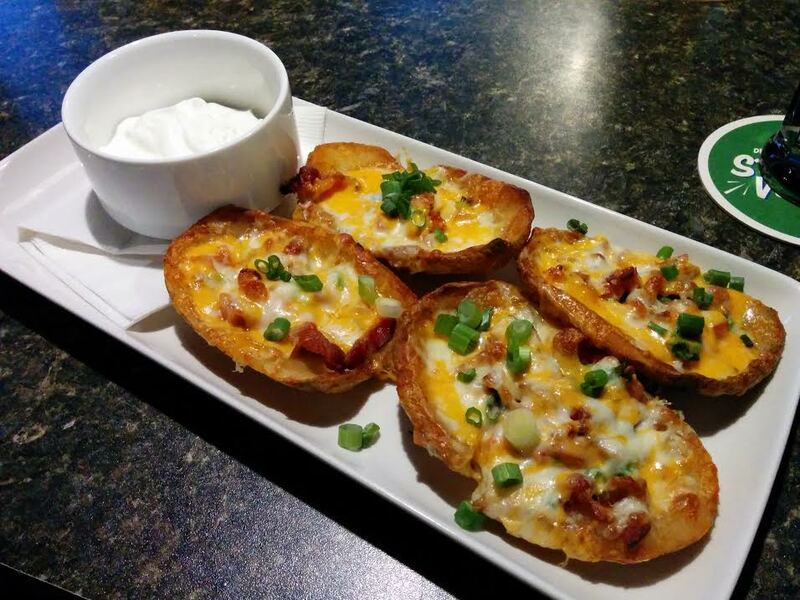 This is what potato skins look like outside the Maritimes. In actuality, the best dessert of 2016 was LuShark’s angel food cake that she made for my birthday from scratch. It was so good (even if she apparently “screwed up the icing”) that other family members are requesting it for their birthdays. For Christmas we have been enjoying a new tradition in cheesecakes from the Sweet Hereafter, of which I’ll sing praises in any given key. 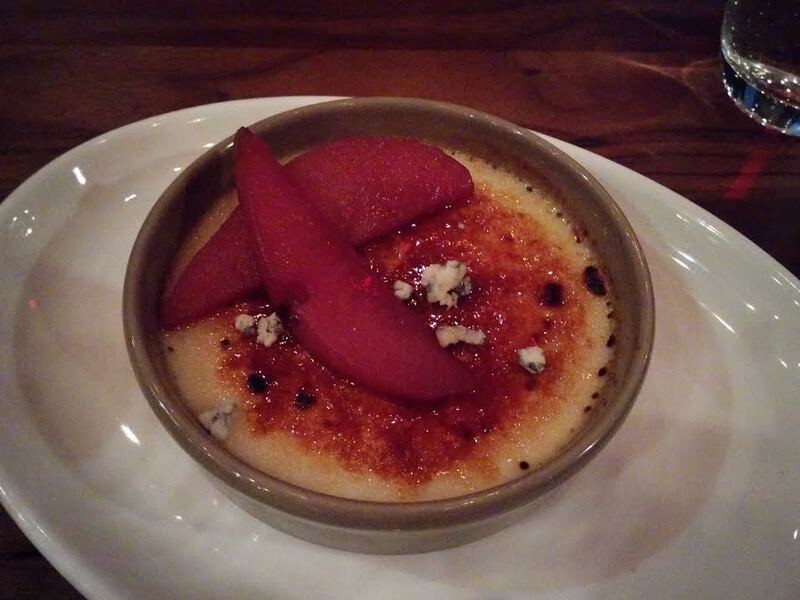 What could possibly be better than blue cheese in a dessert?! Combined with the stewed pears, this combination was mind blowing. Even though it suddenly rained after getting these ice creams, they were stellar even with a touch of rain water added. 3. 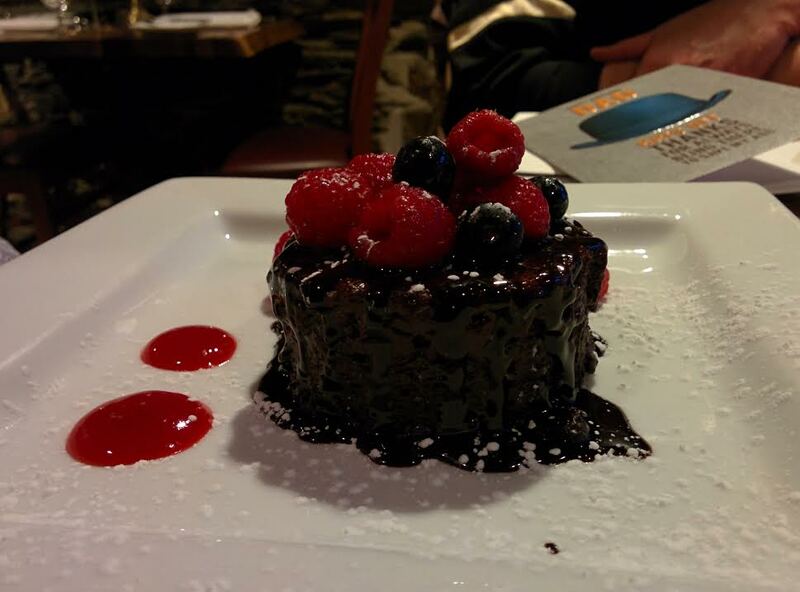 The Press Gang (Halifax) – this chocolate thing. We had a pretty excellent meal at The Press Gang this year, and this chocolate dessert was a big hit. Studio East was by far my favourite brunch of the year. 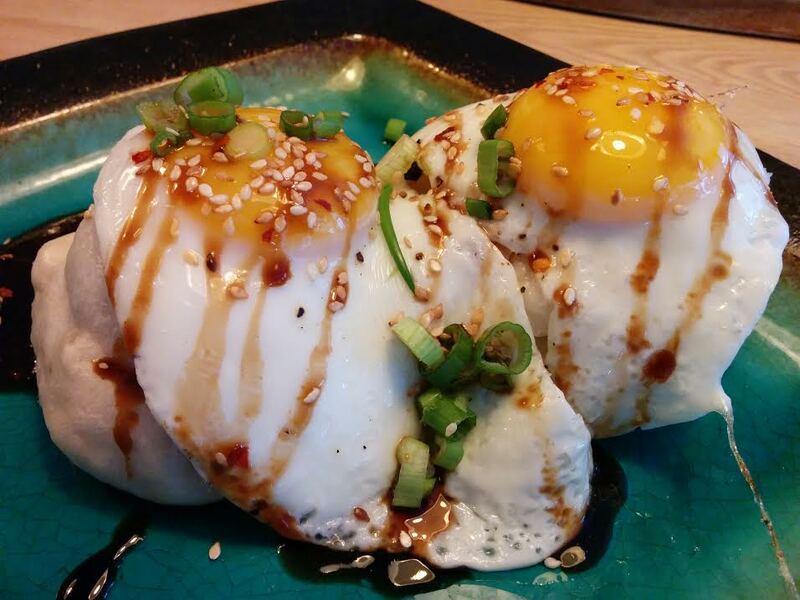 I love the “Global Adventure” dishes like these Steam Buns ($14) with Getaway Farm braised pork belly, sunny side up egg, plum sauce, hoisin, garlic olio, Asian slaw, cilantro, and crispy garlic. You can read the full review here. One of the perks of being a food blogger is that every once in a while I get invited out to a really cool event. 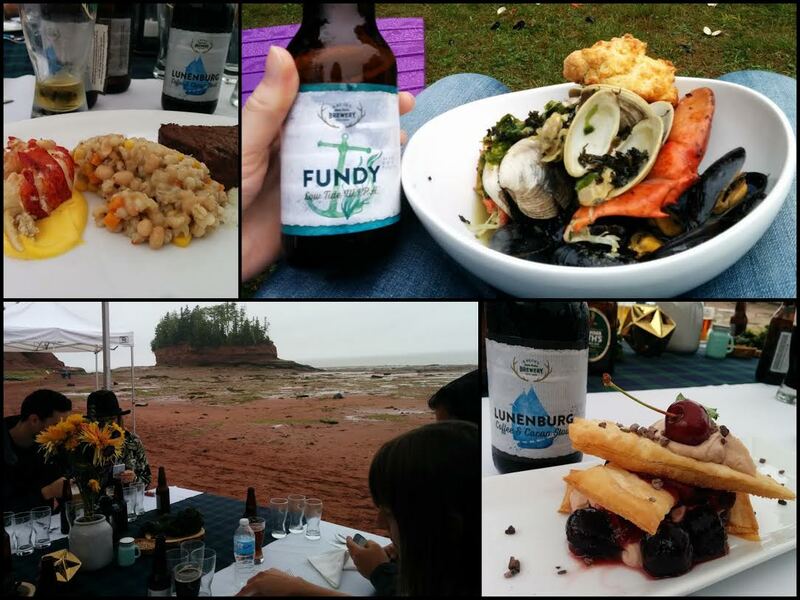 This year Alexander Keith’s invited a busload of people out to a dinner on the ocean floor in collaboration with Flying Apron Cookery and Burntcoat Head Park in order to promote the launch of their new White I.P.A. made with dulse and sea lettuce from the Bay of Fundy. The park at low tide was absolutely stunning, and I loved the seafood boil. We sat in adirondack chairs and threw our shells into a metal bucket in the middle of the circle – ding! We were then treated to a surf and turf dinner on the ocean floor, with as much dulse, sea lettuce and Alexander Keith’s products we could consume! Bravo to Keith’s marketing team for this one! Great job! Well, this wraps up 2016! 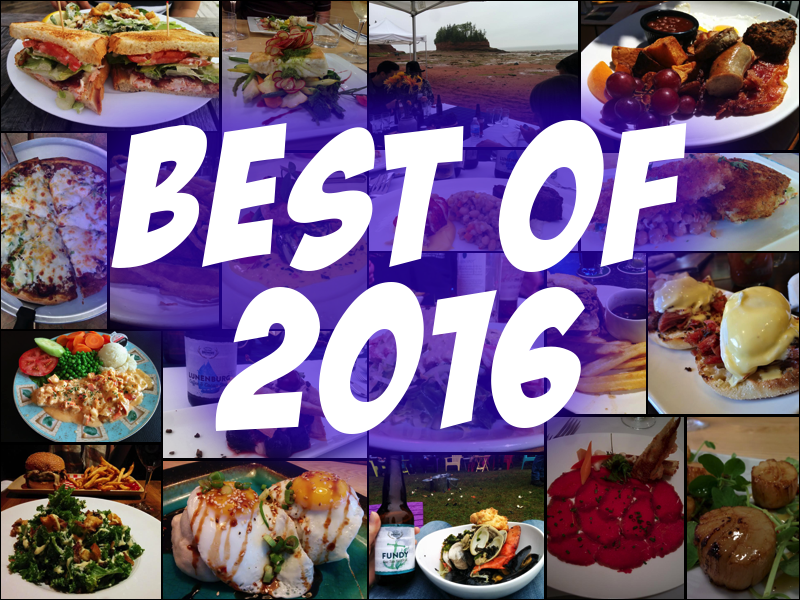 Check out my Best Meals of 2015, 2014 and 2013. See the latest Pizza Quests, Nacho Quests, Brunch and Fish ‘n Chips. Stay tuned for more – including my new series, Nova Scotia Food Profiles.